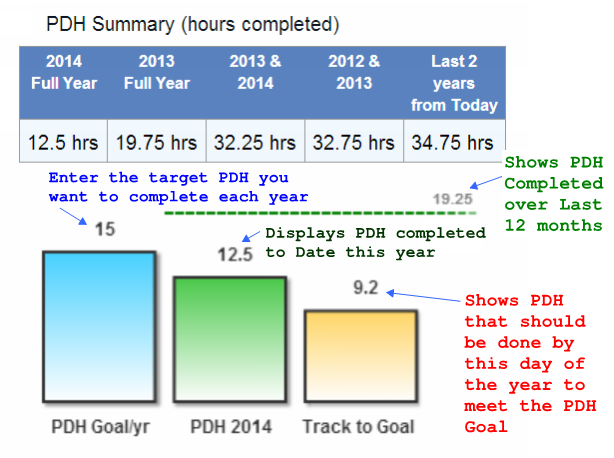 Sample Yearly Tracking Graph automatically tracks your progress in completing PDH hours. Individual license tracking is also automatically provided. Thank you for visiting Engineer-Cloud.com. Please Login or Join to enter the site, or click on the menu links to view example pages and functionality. It is free to join and you don't have to provide any personal information. We strive to be the most complete and easy to use internet site to save, track, and print reports for your PDH training. Save PDH training you take in one location so its easy to know if you are compliant with the board or review agency requirements. Let the site automatically show you if you are trending to have the required training completed by your license renewal. Want an easy way to print out reports to show you are up to date on your training when the board asks (they eventually will). This site does that and more! We have the most useful features compared to other sites and are setup so that it is easy to use all the features from a desktop computer, smart phone, tablet computer, iPad or other similar device with an internet, wifi, or cellular connection to the internet. We dont sell or share your personal data. Enter your PDH training data, include notes from your training in the saved training data, see your license status, see if your training is on track for your renewal, or email yourself a training report for any date range for any license or whenever you want it. This works for once license, multiple licenses, or without even specifying a specific license if you don't want to. Backup your data (it automatically backs it up for you too), and also lets you save your training certificates or other proof of training documents (ie: photo of seminar speaker and agenda, or PDF overview of training session). Site gives you links to FREE Upcoming PDH Training and also provides a list of the major PDH providers for your reference. You may also use this site to track other Licence or Certification training hours. This site does require you to Join (free of charge) in order to use the system. This is required so that we can keep data you enter secure and private. You may enter as much or as little information as you wish to track. Entering your name is not required. Entering a valid email address, or specific license information is not required. Save notes of key items you want to remember. Optional: Have the website automatically email you warnings when licenses are coming up for renewal or are about to expire. Emails are opt-in and are sent only to the email address you choose. Prints and save PDH training reports in .pdf format and on the browser screen. Saves any training, from any provider, venue, or event. Saves your data independent of training provider sites so you are not obligated to use their training, not required to constantly receive advertisement emails from them, and dont have to worry if the training site you are using will stay in business. Click on the menu pages at the top of the screen to see examples. Dont worry, you can customize your own colors. Site Includes a "Free Training" calendars so that site users can share good free training per discipline (either on demand, or upcoming webcasts, why not save $$ if you can). Let the site email you alerts for upcoming individual license expiration's (optional: you choose if you want to activate them). Import your current training records from excel or a csv file. Send yourself backup files anytime (these will import into excel or a spreadsheet). Site Forums discuss new features and let users ask questions. useful engineering forums and publications are linked on the site for easy access. Secure site (your data is protected, and not shared). Site is developed by an Engineer for Engineers (users can request features and we will do our best to add them). Import data from your spreadsheet or other local tracking file into this site's database using the import/export screen. Use this screen to also send yourself a backup file whenever you want. Click on the "Import Data/Backup" link on the left when logged in to access the import/export screen or click on the "FAQ" link for additional details. Added "Training Status" page to menu at top of screen. Shows progress for how each license is meeting training goals and requirements. Added optional License Renewal Period override and PDH required for renewal override to "My Licenses" edit options. Added "Blue Stretch" theme which makes site pages use the whole browser window. Check it out by clicking "My Profile" and then the "Edit" tab. Select the "Blue Stretch" theme and click "save". Added status boxes to home page showing if training completed is trending to meet each licenses requirement at renewal or if it's falling behind. Added status charts for each license which project if training is on track. Added ability for users to change site colors. See default Settings page. Added List of upcoming Free PDH training to PDH Users Zone main page. Added PDH users menu bar to top of screen which appears for logged in members. Updated training reports to print in acrobat© .pdf format. Added notes field to training events entry screen. Take notes during training events and save them with the training record.